Hi, everyone! Melissa DeTora here with a new card from War of the Spark. If you're new here or not familiar with who I am or what I do, I am part of the Play Design team in Magic R&D. My team is responsible for the competitive balance of Magic's most popular formats, mainly Standard and Limited. I am the former writer of a weekly Play Design column here on DailyMTG. The column is no longer weekly, but you can still find it during the release period of new sets. In this column we talk about Play Design philosophy and explain how and why we do what we do, and even post some of the decks we built while we were developing the set. Today, I'm going talk a bit about how we tackled some of the balance issues in War of the Spark, and the thought process behind my preview card. We design sets very far in advance. Years, in fact! We knew that WAR would be a 36-planeswalker set very, very early in its lifetime. We knew this set would be tough to get right for both Standard and Limited, so we started working on it very early. A team of play designers met to theorycraft and discuss what a format like this would look like and what the challenges would be. Planeswalkers change the way a game of Magic is played. They have the potential to take over a game and must be evaluated as such. Whether to attack a planeswalker or player is a very real decision, and not an easy one. Planeswalkers add a lot of complexity to a game of Magic. Suddenly, you have a new target to point a burn or removal spell at, and something new to attack. When you add more planeswalkers to the board, those factors multiply. Let's just say that I was very skeptical that a 36-planeswalker set would work in Standard. Early in WAR's vision design, our newly formed Play Design team was tasked with evaluating what a Standard deck would look like with WAR. This was a tough one for us, because at the time both Guilds of Ravnica and Ravnica Allegiance were not yet in the Future Future League (our Standard testing league) and were still in early stages of set design. Without knowledge of even what that Standard deck would look like in that format, let alone in the planeswalker set format, we took on the challenge as any passionate Magic players would. Using history as our guide, we studied Superfriends decks (a term that describes a deck with lots of planeswalkers) of the past, looking at things like planeswalker count, removal packages, mana base, and more, and started building decks. We built several decks, but our focus was on the Superfriends decks. If the number of planeswalker cards in Standard increased, we'd need to know what it looked like to have boards with lots of planeswalkers in play. We looked at things like complexity, and what types of answers we'd need to make this format fun and balanced. This is a very strong rate for a WW evasive creature. The stats being Shock-proof and it having flying met our goals for an aggressive creature that was effective at attacking planeswalkers. We thought this creature was a positive addition to White Weenie decks. While they are great at going very wide, they didn't have very many ways of getting through in the air. 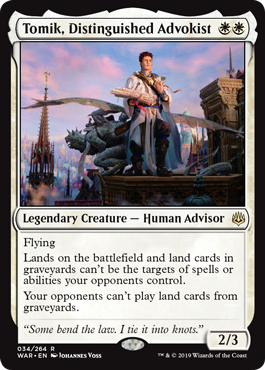 If players wanted to swap this in for Adanto Vanguard, or Tithe Taker if they wanted more ways to tick down planeswalker loyalty, we felt this was a solid option for them. But this card is incomplete. What could the rest be? Now, here is a completely different story with a lesson of how we can solve different problems with one card. Dave Humpherys, lead set designer for War of the Spark and our resident Magic Online data cruncher, was concerned about the dominance of Deathrite Shaman decks in Legacy. Keep in mind that this was long ago, before Deathrite Shaman was banned in that format. He was looking for an answer to Deathrite Shaman that Death and Taxes would play, while also being a hate bear against other decks in the Legacy format, such as Dark Depths and Lands. At the time WAR was in set design, both of these strategies were popular. Additionally, Dave's idea would also be a safeguard for Standard in case there was any strategy that was stronger than we anticipated, such as Crucible of Worlds or a land-destruction strategy. We were skeptical that this would be the case, but we like to lean more heavily on safeguards than not in case we are wrong. 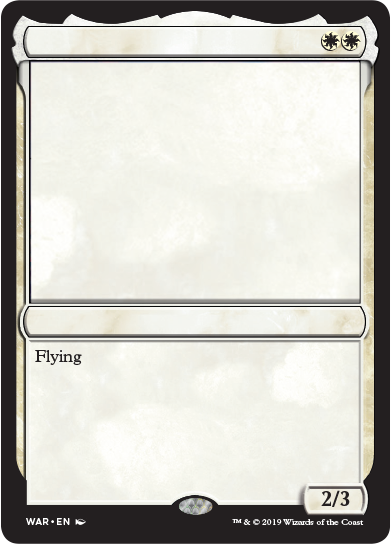 While I've seen red-white Star of Extinction decks pop up here and there on MTG Arena, they are pretty fringe and not very strong. However, we did not know that for certain when we were working on WAR. May I present to you Tomik, Distinguished Advokist. As the Legacy players out there know that the Deathrite Shaman issue is no longer an issue, this card met many of our other goals: being a strong card for a Standard White Weenie deck against a field of planeswalkers, and being a safeguard for Standard and older formats. There's more to this card than it seems right now, specifically with it being a legendary creature, but you'll have to wait a bit to find out why. When you figure it out, let me know on Twitter @MelissaDeTora. That's all I have for this round of preview cards. While you probably won't see another article from me until the next set, but you can find me streaming on Twitch every Monday from 2–4pm PT with Paul Cheon, on Magic's official Twitch channel, twitch.tv/magic. See you next time!